The CraftSanity Apron Show & Silent Auction opens this Friday and I can’t wait for you folks to see all the great aprons that will be on display. Top winners will be announced during the opening night festivities beginning at 6:30 p.m. at the David D. Hunting YMCA, 475 Lake Michigan Drive NW. You can read the back story of what led to this show in my Sunday GR Press column. The short version is that fifty-four people from New York to California sent in entries for this apron contest to benefit my Fifth Third River Bank Run 25K charity sponsor Safe Haven Ministries. 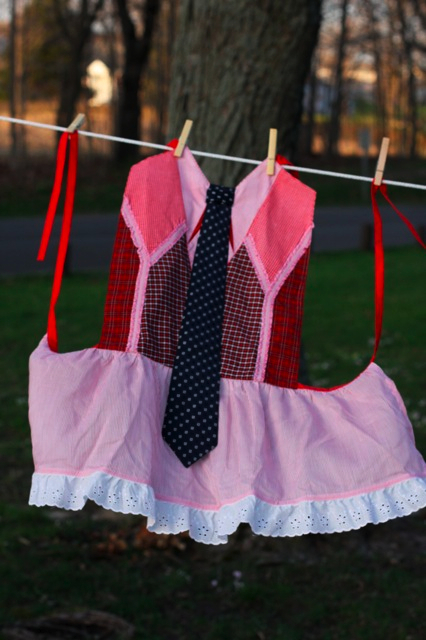 Each apron features fabric from a necktie to symbolize how men and women must work together to stop domestic violence. Come out and see 82 aprons with attitude and bid on your favorite one. Come early and enjoy a slice of pie and cast your vote for the apron you feel is most deserving of the People’s Choice Award. If you can’t make it Friday, no worries. The show will be up through 5 p.m. Thursday, May 6. And for those of you who live too far away to come, check CraftSanity.com for online bidding updates and a photo gallery after the show opens. Thanks again to everyone who donated an apron. This event would not be possible without your generous craft talent! Thank you! Howdy just wanted to give you a quick heads up. The text in your article seem to be running off the screen in Firefox. I’m not sure if this is a format issue or something to do with web browser compatibility but I thought I’d post to let you know. The style and design look great though! Hope you get the problem solved soon. Many thanks. I’ve been exploring for a bit for any high quality articles or blog posts on this kind of house . Exploring in Yahoo I ultimately stumbled upon this website. Studying this info So i’m happy to exhibit that I have an incredibly good uncanny feeling I found out exactly what I needed. I so much indisputably will make sure to don’t disregard this web site and provides it a look on a continuing basis.